Cover based on an original painting by Omar Ibrahim, designed by Julien Taquet. The Cost of Freedom is not a statement about freedom and culture — it is a primal scream — the sum of our questions and desires. It is the raw expression of our lives. It talks about what is ultimately made through the dream of free culture: us. The many contributions in this book offer a unique snapshot of its dreads and interrogations, and a tentative program for the reader to reflect on the future of freedom in our times. All sales goes to support the #FREEBASSEL Campaign. This book is dedicated to Bassel Khartabil, loved and celebrated Internet volunteer detained in Syria since March 15, 2012, and to all those who will recognize themselves in the stories told in these pages. Help us free him by visiting freebassel.org and signing this petition. Bassel should be free. We will not stop campaigning for him until we see him as a free global citizen once again. This book is born in an attempt to free Bassel Khartabil, loved and celebrated Internet volunteer detained in Syria since 15 March 2012. His name has been deleted from the Adra Prison’s register where he was detained, on 3 October 2015. We have not received any information about his current status or whereabouts since. The introductory part of this book called Collective Memory gives voice to his friends and family that have been urging for his release and want him back in his normal life and freedom, immediately. Seeing Bassel paying a high price for his participation in free culture, many of us have started to reflect on our own fates, actions, and choices. Why are we here today? What have we chosen? What have we given up in this process of sometimes extreme belief? The second part, OPENING: FREEDOM, is a recollection of personal, sometimes contradictory reflections and views about the experience of working within free culture for some years. The diversity of contributions express the many directions that have been taken to act. The third part called ARCHITECTONICS OF POWER takes a step back to look at how we, as a society, deal or fail to deal with the different barriers that stand in our ways towards freedom. Different authors analyze the contradictions of their choices and daily activities with larger objectives and lifestyles associated with the free culture. The variety of professions and situations of the contributors offer an illustration stained with multiple tones. Finally, the fourth part AFFORDANCES offers a reflection on theories and successful practices of free culture. It offers different perspectives on the nature, structure, motivations and limitations of existing levers towards liberation, not only legal and technological but also social and cultural. This book was written in Pourrières, France from November 2nd to 6th, 2015. Presentation and brief readings from the book (video). An article about the book in the Creative Commons Taiwan newsletter. An effort to translate the Cost of Freedom book in Czechish has started. Czech speakers: any help is welcome ! The Seattle Star has selected the Cost of Freedom for its weekly review and helped made it available as an epub. The 202nd weekly Disquiet Junto project “Create an audiobook chapter from the new essay collection The Cost of Freedom” has been released with 27 tracks available on Soundcloud. Each Thursday, a new compositional challenge is set before the the Disquiet Junto group’s members, who then have just over four days to upload a track in response to the assignment. The challenge this week was “Create an audiobook chapter from the new essay collection The Cost of Freedom”. 44 contributors, including 12 on-site book sprinters, wrote, compiled, and edited more than 50 original contributions, including paintings, poems, personal reflections, critical observations, polemical pieces, and theoretical treatises. 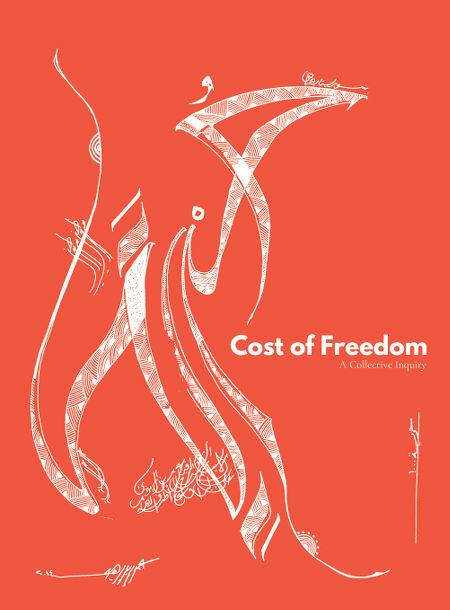 After five days, we finished the Book Sprint and released the book “Cost of Freedom” on Monday, November 9 2015 under a CC0 license on costoffreedom.cc. You can join the process of improving this book by reading, translating, sharing, reviewing or printing it. This work is released under CC0.